This is second in the trilogy when hetty goes off to find her mum. Hetty Feather (or as she prefers to be known, Sapphire Battersea) has returned. Fourteen years old and her last day at the Foundling Hospital. Soon to be pushed into the harsh, unknown, outside world, she becomes a servant for a sly old man. Hetty tries to be reunited with her mother, but things don’t quite go to plan. I found this book really depressing and it really upset me in places. I actually read another review of this book on Amazon, where a woman’s nine-year-old daughter actually burst into tears whilst reading this because it was so sad, and I can almost relate to that. Happy moments in this book were non-existent. Don’t get me wrong, I enjoyed this book a lot. It was really interesting, the characters were great and well-developed and the plot was gripping. Love the cover too! I was actually late for school one day because I couldn’t put the book down! The only flaw is that I’d start reading the book happily and when I finished I was sad and miserable, and not because it was the end of the book. Not a very light-hearted read and not entirely believable in places. Otherwise, though, this was quite a good book. Even though the age rating is 9+ I would recommend it to 11+. 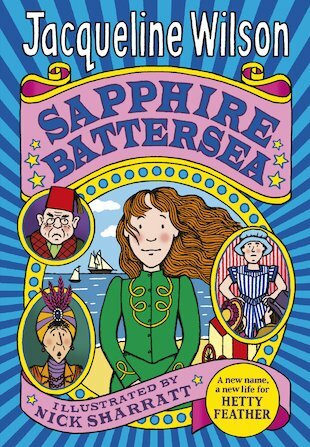 I recommend this book to fans of Jacqueline Wilson and fans of the Victorian-era. 3.5/5. i loved this book,it was sooo moving.a follow on to hetty feather and i thought it would just end at that,from my review jackie fans should seriously check this book out!! if you dont you are missing out on a great oppitunity ! !